Lee & Low Books, 9781620141489, 48pp. William "Doc" Key had a special way with animals. Growing up enslaved in Tennessee, Doc was sent to plantations around the state to care for sick and wounded animals. When the Civil War ended and Doc was freed, he began to dream of breeding a winning racehorse. But those dreams were dashed when his colt was born weak and sickly. Although many people would have euthanized the colt, Doc nursed him back to health and named him Jim. Noticing a level of curiosity and eagerness in the horse, Doc began teaching Beautiful Jim Key first to recognize letters, then to read, write, add, subtract, and more. Doc soon took his talented horse on the road, spreading a message of patience and kindness, over cruelty, to all animals. 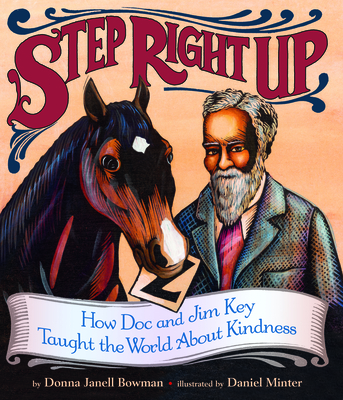 With striking illustrations by Daniel Minter, Step Right Up is the inspiring story of one man and one horse who showed the world the power of kindness. This biography explores Common Core English Language Arts Standards and Social Studies Standards.